It's finally happened. Dale-Ila Riggs of New York, after three years of work and steadily reduced spotted wing drosophila in her blueberries has achieved total exclusion of this pest. This is a huge accomplishment! Thanks to Fruit Grower News for sharing the video. Will provide recommendations for growers to prepare for the 2017 growing season. 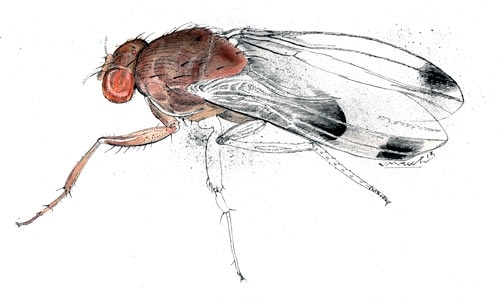 Join eOrganic for a webinar on organic management of Spotted Wing Drosophila on February 1, 2017, at 2PM Eastern Time, 1PM Central, 12PM Mountain, 11AM Pacific Time. The webinar is free and open to the public, and advance registration is required. Efficacy and Phytotoxicity of Biopesticides for Management of Spotted Wing Drosophila (SWD) in Raspberries. IR4, the branch of the USDA focused on speciality crops, identified research on SWD as a priority need. The purpose of this efficacy and crop safety trial was to determine the level of SWD control by organically registered biopesticides in caneberries to determine the impact on plant and yield variables. The test site consisted of three replicates of each treatment in Table 1 below. Plots in the active organic raspberry ranch were arranged in a randomized complete block design. 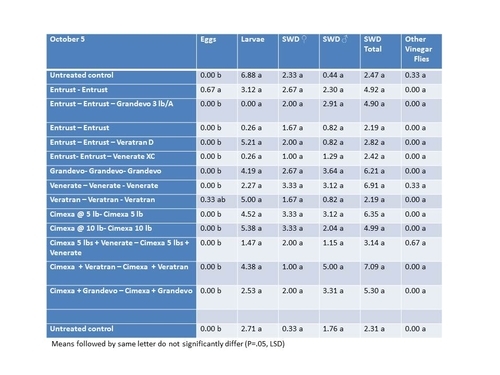 Since SWD is a mobile pest, the 3 replicate plots of each treatment (see Table 1 below) were large, consisting of three raspberry hedgerows across, being 54 ft long and 14 feet wide (756 ft2). Statistical analysis was done on ARM, version 9. All test substances were applied with a motorized Maruyama 058 backpack sprayer with a hand gun at a pressure of approximately 120 psi. Each material was mixed in a water carrier rate of 75 gpa. Three total applications were done; beginning 9/17/2015, 9/25/2015 and 9/30/2015. Because of excessive residues for the Cimexa Gel material and request of the collaborating grower that this material no longer be applied, no applications of any treatment of Cimexa Gel were made on the last date. One day prior to the first application of September 17, samples of 10 marketable fruit were collected from each replicate plot and further a section of 18 ft long from the center hedgerow was vacuumed with a Bug-vac for adults. Fruit were held for several days and then each evaluated under the dissecting scope for SWD larvae and eggs. The vacuum sample was evaluated for female and male SWD, along with other insects taken in the sample. Subsequent sampling and evaluation dates were Sept 22 (pre-sampling), Sept 28, Oct 5 and Oct 16. 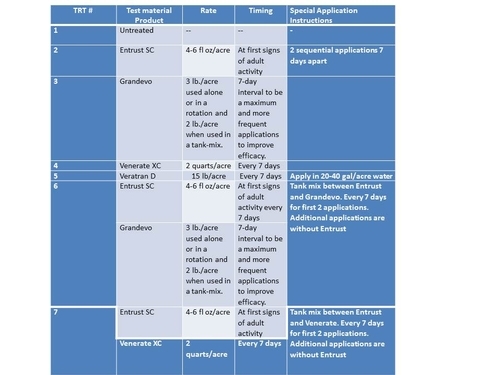 The sampling date for October 5, taking place after full application of all treatments and thereby likely to give the most meaningful results, is given below. 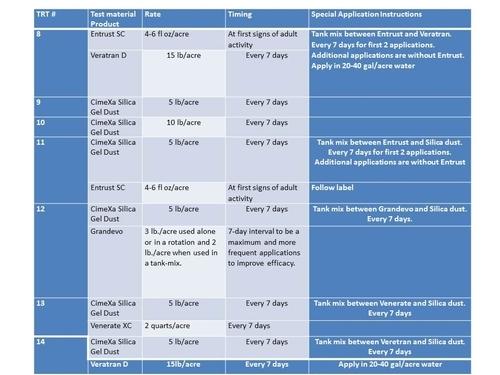 Note that no evaluations were done of treatments containing Cimexa Gel on the last sampling date. No supplemental treatments of any kind were made to the crop during the course of this study. 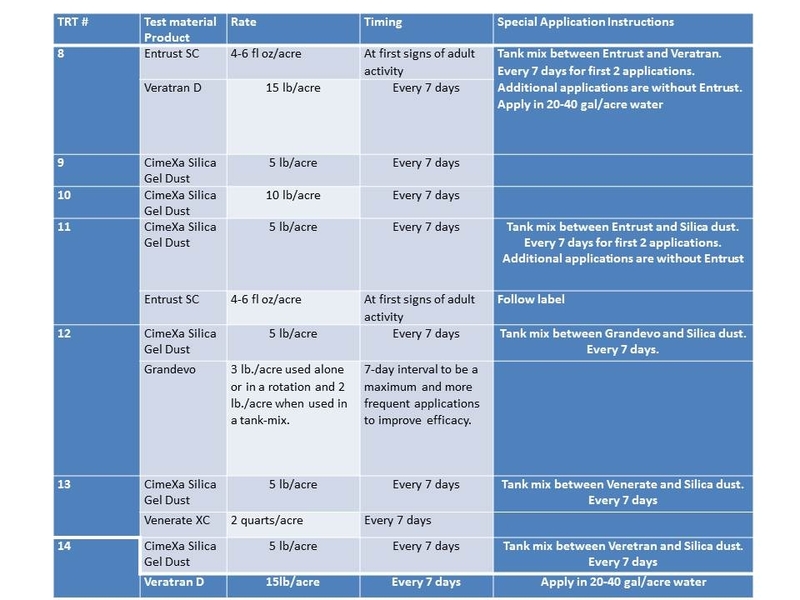 While there was a tendency for treatments containing Entrust to have lower numbers of larvae found in fruit as other treatments after completion of all three applications on the Oct 5 sampling date, none of these differences are statistically significant and as such regarded with caution. Furthermore, the residue of CimeXa Silica Gel Dust on leaves, canes and fruit of plants subjected to its application was unacceptable and as such this material is not recommended for further study. Hat tip to research assistants Don Yoshimura and Monise Sheehan, without whom I could not have possibly done this trial. 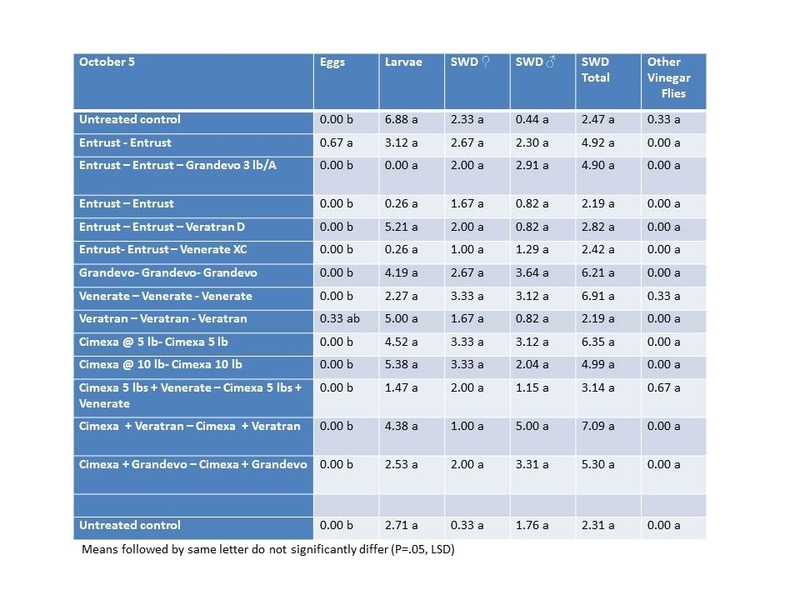 October 5 Results of 2015 SWD Biopesticide Study. I've been getting a number of calls lately concerning spotted wing drosophila in caneberries and strawberries, especially from growers on the smaller scale – in most cases organic operations. One should take a two pronged approach. First the use of Entrust (spinosad) as a spray is recommended, while at the same time, to the extent possible, one should be removing the cull fruit (rots and over-ripes) from the field and burying them or throwing them away. For strawberry growers running the tractor over the culls in the furrow can be useful - not so much because it crushes the larvae, but because the flattened fruit dries out quickly and loses its property as a suitable food source. The spray is reducing the number of adults, while at the same time all routes of maturation are no longer available to the fly. Harvested fruit is removed and sold, and cull fruit is removed or destroyed, so there is no way for the larvae to complete their life cycle and turn into more flies. That said, two years of research tells us to recognize that removal of cull fruit alone will not be enough to bring the population down to acceptable levels. There will always be the one fruit that is missed but yet contains the propagation potential in it to re-infest your field. That is why the best route for you is to spray along with practicing good sanitation. Final word would be to take note of what is around your field. Are there any patches of uncontrolled spotted wing drosophila next door or wild blackberries? Both of these areas are serving as hosts and it will benefit you to get some control there also. There is a pesticide mentioned in this article for control of spotted wing drosophila on the small scale. As always, before using such a pesticide, refer to the product label for directions on use. Those of you interested in organic management of spotted wing drosophila might want to catch this one.